A few days ago I spent the day in Szczecin (or “Stettin”, as it is called in German), a city in Poland which is located very close to the country’s border with Germany. From Berlin, Stettin is an easy day trip (the direct train takes just 1 h 50 minutes!) so I like to visit every once in a while. In this case I hadn’t been to Stettin for a couple of years so I used the opportunity to do some store checks (Rossmann, Douglas, Sephora, Hebe, Drogeria Natura, Dayli, Carrefour, Auchan), keeping an eye out for new beauty brands (organic and otherwise!) and also checking on the organic food situation while I was there. 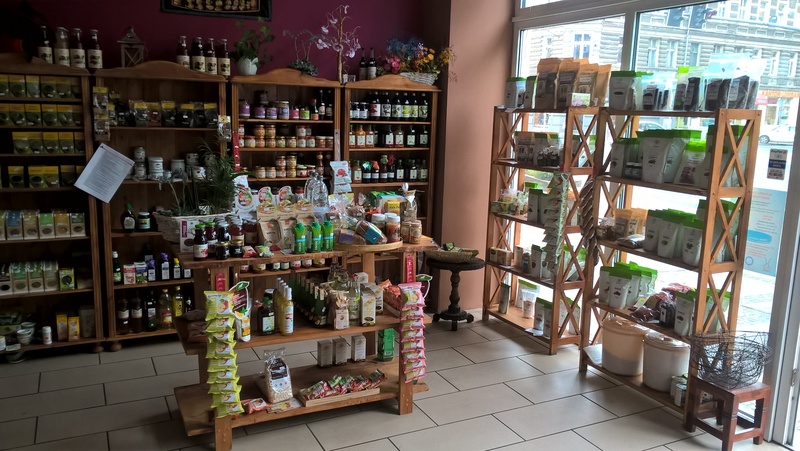 On my recent trip to Budapest I had been surprised by the strong presence of Vegan and Paleo foods in the city (check out my store profile of Bio-Barát) so I was on the lookout for similar developments in Stettin. 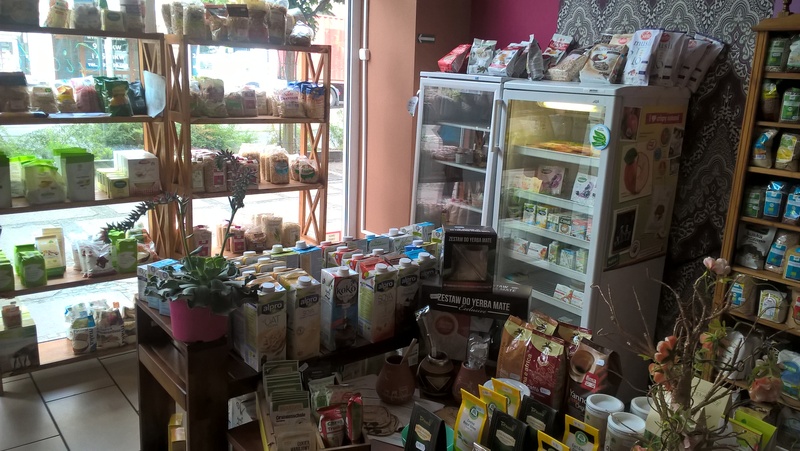 And I did find something interesting: Vegananda, a charming little Vegan store and café which was opened exactly a year ago. 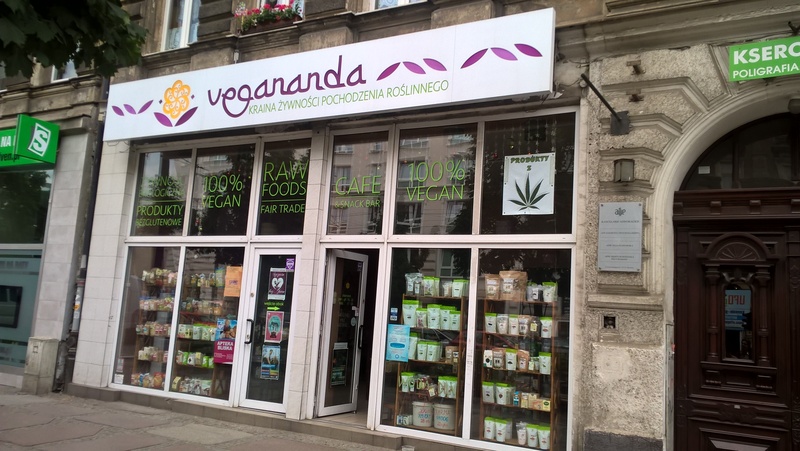 Vegananda is located very centrally on Krzywoustego street. 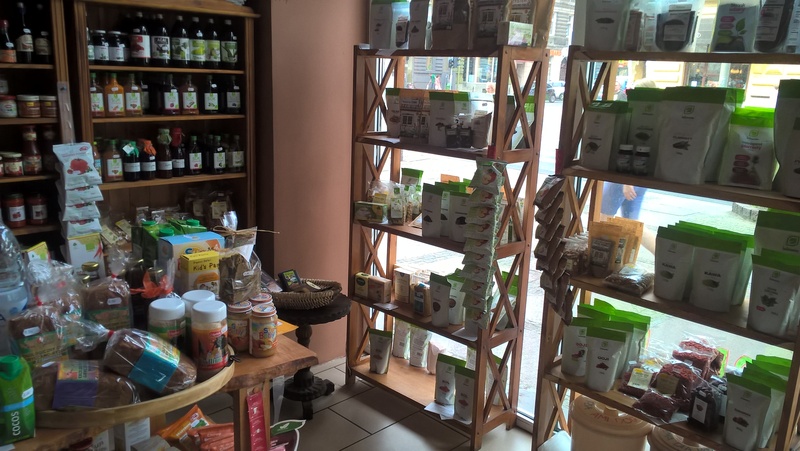 Once you enter the store you standing in the middle of the retail area: Vegananda sells Vegan food products from a range of European and Polish brands, including spices, teas and Superfoods, flour substitutes (I bought a bag of Topinambur flour because it looked interesting! ), sugar substitutes (birch sugar, coconut sugar) and milk alternatives. There was also confectionery (including Polish chocolate brand Cocoa which I love! And this is coming from someone who isn’t even a fan of raw chocolate…. ), noodles and rice, a special display with hemp products (including hemp lollies! 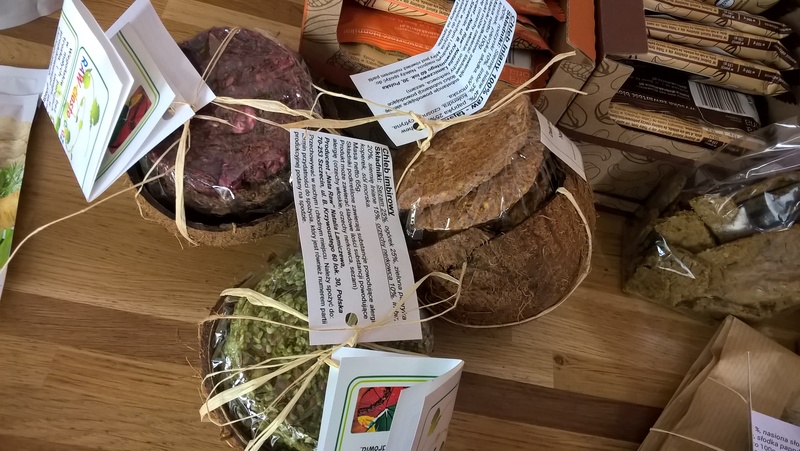 ); Vegan spreads and jams and even some raw foods – check out the three differently coloured raw bread variants on the pic below (round slices packaged in half a coconut!). 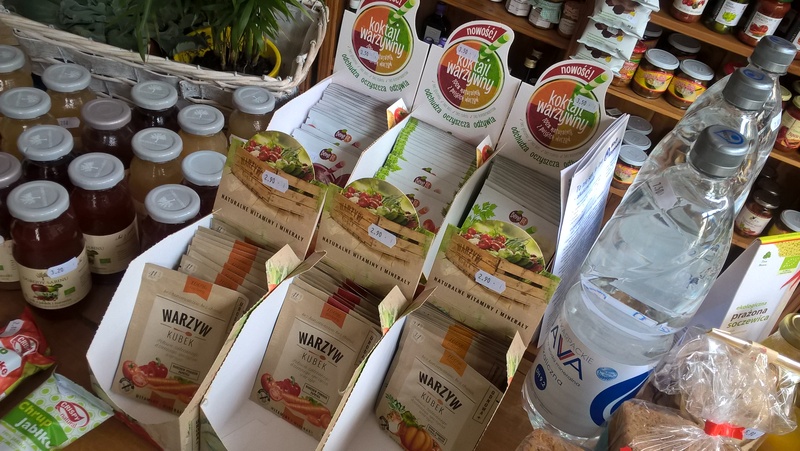 I saw a small display of individual sachets of powdered fruit and vegetables (see picture above! The brand is called Ecobenefit) which you can mix into your smoothies or health shakes – convenient! I also bought a bag of ground green coffee beans from Intenson. Over the past year I’ve become a fan of green coffee and this particular mixture had a subtle spicy note which I liked. In the back area of the store is a small café with comfy sofas and chairs (somehow I omitted to take pics of the café area) – Vegananda serves a range of hot beverages and home-made cakes and sweets. Nice! 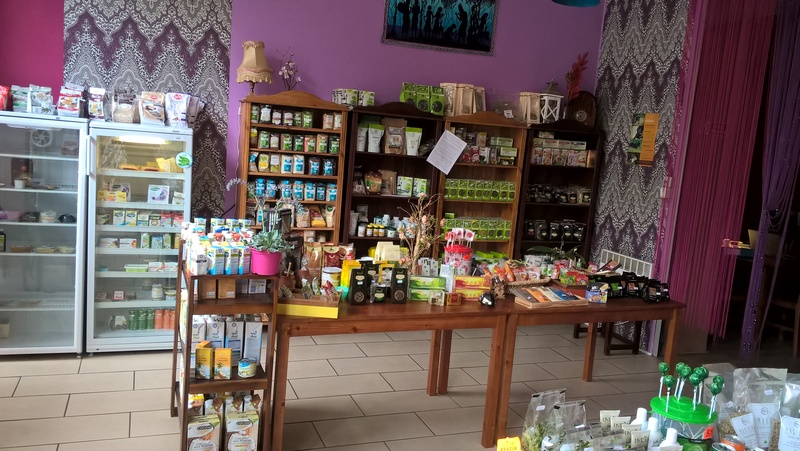 You can find Vegananda here: Bolesława Krzywoustego 36, 70-253 Szczecin, Poland. More information is available on the store’s Facebook page.